Do you have big ambitions for your event? Would you like to increase your attendance? Think about getting a sponsor to achieve your goals, whatever they are! Which sponsor for your event? Before contacting a potential sponsor, you need to know how to convince them! Firstly, you should identify your common­al­ities, whether it’s a shared passion, a commitment, or something else. This is what will pique the interest of the brand and convince its repres­ent­atives to invest in your project. Make a list of what you need: financing, visib­ility, equipment, etc. Financial sponsoring: In this case, you reach out to a company so that it can help finance your event in exchange for advert­ising space. The size of the advert­isement will depend on the size of the brand’s contri­bution to your budget. Equipment sponsoring: Organ­ising an event requires a lot of equipment: Tents, bars, furniture for “chill out” areas, cups, stage lighting, decor­ation, and so on. Asking brands to provide the necessary equipment to set-up the event enables organ­isers to lower their expenses. The upside of this type of sponsoring is the oppor­tunity for the sponsor to gain brand awareness. Indeed, the sponsor can provide branded equipment to ensure they maintain control of their brands’ on-site advert­ising. Service sponsoring: a lot of your fees will be related to advert­ising — promoting your event in the media, creating a website, etc. — as well as security and venue hire. Partnering with local companies or local govern­ments may help you lower these expenses. Events are great oppor­tun­ities to increase their reach or, in the case of the media, simply provide them with exclusive content; which is why they are generally happy to take part in this type of sponsoring. For instance, you can provide brand awareness to some media outlets who will, in turn, provide you with free advert­ising spaces and, as a result, enable your event to reach new target audiences. Be careful, however, not to enlist the help of competing media and to choose your partners carefully, based on your target audience. If you are looking for a sponsor for the first edition of an event, no need to aim too high. The size of the sponsor is not what matters, what matters is their level of involvement in the project. A small company will sometimes be more willing to help than a large one. Browse the websites of the companies that you would like to attract as sponsors and gain a good under­standing of who they are and what their goals are. The idea here is to find all possible touch points between your event and the brand, i.e. what’s in it for you and what do they have to gain in return? What are your assets? What can you offer the brand? Make an estim­ation of how big your audience will be and what the media coverage will be for your event. Well quantified, this data is a true asset for your event when trying to convince the brands to sponsor you, as they will show interest in the level of awareness. What values would you like to promote through your event? What is the story that you would you like to tell? Finding shared values between your event and the brand will be an additional argument to prove that you will help the brand strengthen its image. 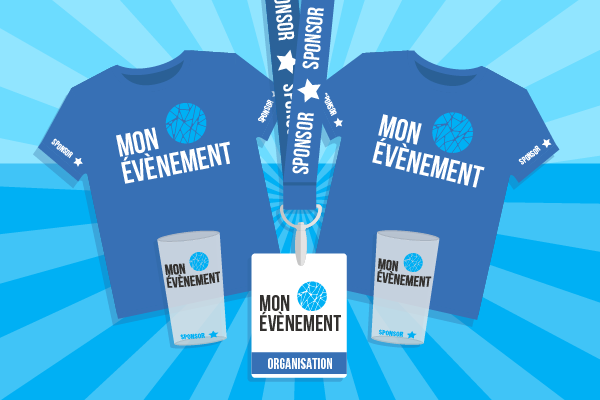 Think about actions or activ­a­tions that it could organise for the event: goodies, speeches, whatever you can imagine! Finally, quantify the number of spaces that you can provide for your sponsors, along with — if possible — an estimate of the number of impres­sions, i.e. people who will see their logo or slogan. This will allow you to put a price on your advert­ising spaces (both physical and virtual, count everything: from posters on site to website banners). Once you have identified the brand(s) that suits your event best, you can move on to the next step: putting together your sponsoring applic­ation. Our advice is to design it a bit like an advert­isement brochure. Make it attractive and pleasant to read, insert infographics and pictures, and insist on a clear graphic identity, one that is neat and will truly stand out. Be compre­hensive while remaining concise. Present your project: its concept, its goals, its identity. Include inform­ation on your target audience, any partner­ships already in place, your planned media and commu­nic­ation strategy, the size of your infra­structure and the recur­rence of your event — one-time or repeated. If you have already organised an event, think to include its reviews. It is the same type of content that you would find in a press kit for brands — story, goals, program, partner­ships, practical inform­ation, etc. Set out your needs: Financing, visib­ility, equipment, etc. Be careful to justify your needs with numbers or at least associate clear objectives that can be under­stood by the brand. In order to justify them, you can detail what you are willing to offer. Then make a concrete offer. What will the brand gain from sponsoring you? What goals will you meet? How will it be set up concretely at your event? Where will the brand be visible? Are you offering simple posters with their logo or can the brand organise activ­ities to have a bigger impact? Possib­il­ities are endless, try to seduce them by giving them solid reasons to help your project. Do not hesitate to offer packages, they are clear and easy to under­stand. Commu­nic­ation supports: You can place your sponsor’s logo on all your commu­nic­ation supports: flyers, posters, teasers, website, event programme (you can even dedicate an entire page of the programme to them so they can talk about their company and increase their brand awareness). Customised areas on-site, dedicated to the brand: a lot of brands, especially food and drinks brands, are used to custom­ising points of sale with their brand image. They can, therefore, provide you with equipment while maintaining control over how they want their logo to be displayed at your event. Goodies: Some brands could hand out goodies and/or product samples at your event. This can be a real win-win situation for everyone. This kind of awareness is good for the brand as it will put them in touch with potential customers, and it will benefit both you and your audience as well. Compet­i­tions: Media outlets, sponsors and partners could run compet­i­tions on social media for people to win goodies or tickets for example. For instance, compet­i­tions asking people to “like, share and comment on this post to win gifts” are a good way to signi­fic­antly increase your visib­ility and reach audiences that you would not otherwise have reached and the same goes for your partners. Everything is now ready for you to move on to the next, more complicated, step: Getting in touch. You can try getting in touch with potential sponsors at trade shows or by phone, but you should expect some diffi­culties. Sending emails and following up on the phone remains the best and most efficient way. You have succeeded in booking a meeting? (It can take some time, do not despair!) On the day of your present­ation, be original. Bring some new inform­ation about your project: how has it progressed since your applic­ation? Have you secured any new partner­ships? Have you had new ideas to add to your offer? Support your present­ation with a slide show, and why not include videos? Show that you under­stand the company you are speaking to, that you know your project is perfect for them! Brands appre­ciate being offered exclus­ivity for an event, but it is up to you to choose one or several sponsors. Why not find a different sponsor for each of your different needs? You can provide them with customised offers depending on the type of service the brand will offer you.